Find the -coordinate of the relative maximum on the interval . To find relative maximums, we need to find where our first derivative changes sign. To do this, find your first derivative and then find where it is equal to zero. Because we are only concerned about the interval from -5 to 0, we only need to test points on that interval. Try points between our two extrema, as well as one between -8/3 and -5. So our first derivative goes from negative to positive at -8/3, thus this is the x coordinate of our relative maximum on this interval. Though there are relative maxima at and (found by setting the first derivative of the function equal to zero and solving for x.) the maximum value along the whole interval is actually at the upper endpoint, when . When looking for extrema along an interval, looking for zeros of the first derivative does not account for endpoint extrema. To determine the relative maxima for the function, we must determine where the first derivative of the function changes from positive to negative. To check the sign of the first derivative, plug in any value on each interval into the first derivative function. On the first interval, the first derivative is positive, on the second, it is negative, and on the third it is positive. The first derivative changes from positive to negative at so a relative maximum exists here. using the equation and/or the following graph. We know that extrema exist when the slope of the function is zero, hence we take the derivative, set it equal to zero, and than solve for x. 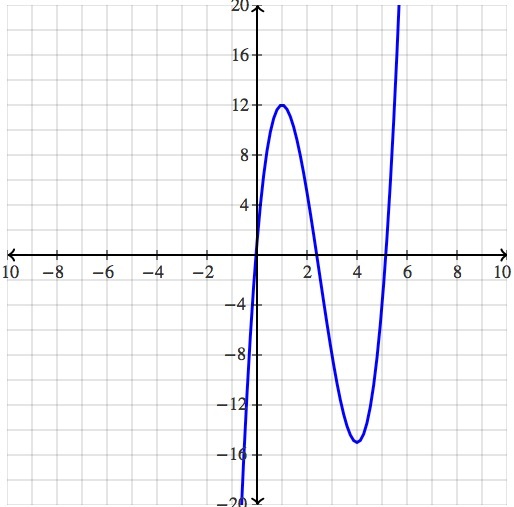 Finding out if one of these x values produce a local min or max however requires either the first derivative test, the second derivative test, or analyzing the graph. We see that for a small neighborhood around , is the largest term, hence it is a local max. Similarly, for a small neighborhood around , is the smallest term, hence is a local min. Therefore when is the only spot in which a local max occurs. Remember that it is not the x value that must be the largest, rather it is it's corresponding y value. The following is a list of values at certain points for continuous . By mean-value theorem, how many zeroes must this function have? The mean value theorem states that if continuous has , then for all , there must be an that maps to , so since the value above go from negative to positive twice, zero must be mapped to at least twice. A relative minimum of a function is all the points x, in the domain of the function, such that it is the smallest value for some neighborhood. These are points in which the first derivative is 0 or it does not exist. 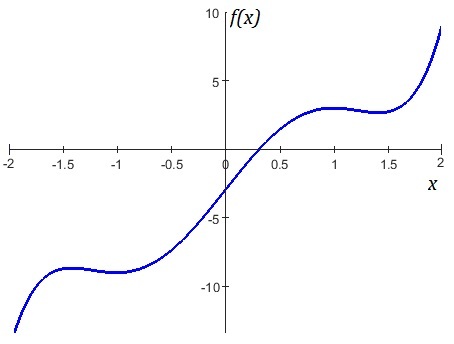 using the following graph and the function. 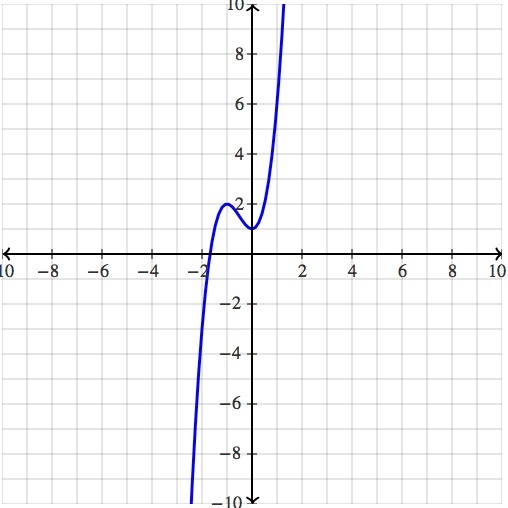 Finding out if one of these x values produce a local min or max however requires either the first derivative test, the second derivative test, or analyzing the graph. We see that for a small neighborhood around , is the largest term, hence it is a local max. Similarly, for a small neighborhood around , is the smallest term, hence is a local min and the only local min of this function. Remember that it is not the x value that must be the smallest, rather it is it's corresponding y value. Brandeis University, Bachelor of Science, Neuroscience.